If your job is complete or you want to send a progress invoice to your customer, this article is for you. 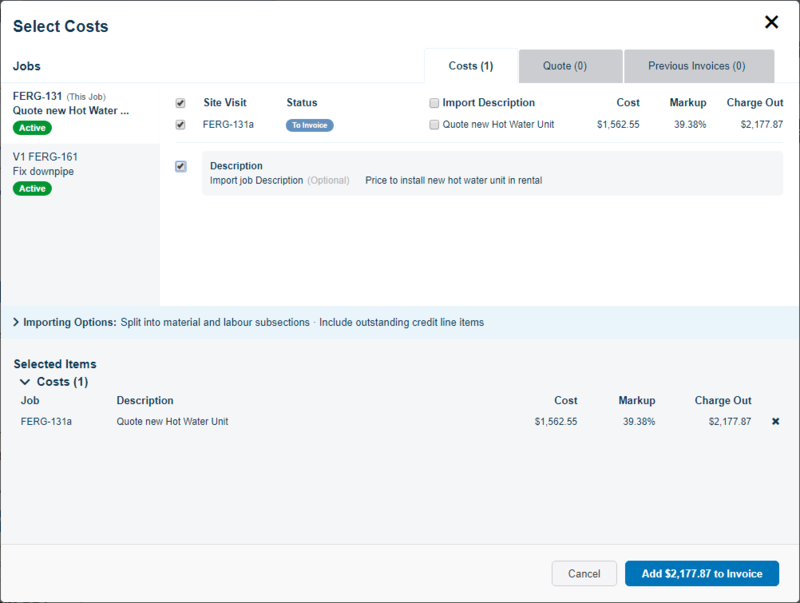 Create New Invoice creates a blank invoice and shows you the Add Costs screen which lets you choose which costs to invoice out. 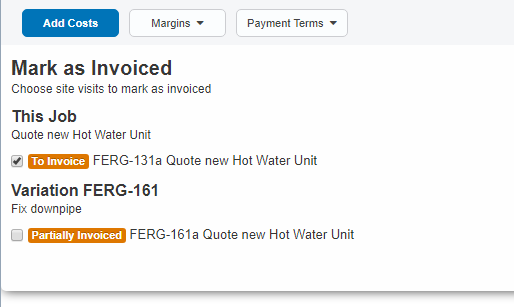 Create Invoice from Quote creates a blank invoice and shows you the Add Costs screen with the Quote tab selected. If you're working on a charge-up job you won't see this option. In this example we'll tick Site Visit A FERG-131a to invoice out, and then click Add $2,177,87 to Invoice. Ticking a site visit brings all materials and labour entered against that site visit onto your invoice. Invoice out a percentage % of the currently accepted quote or estimate on the job. 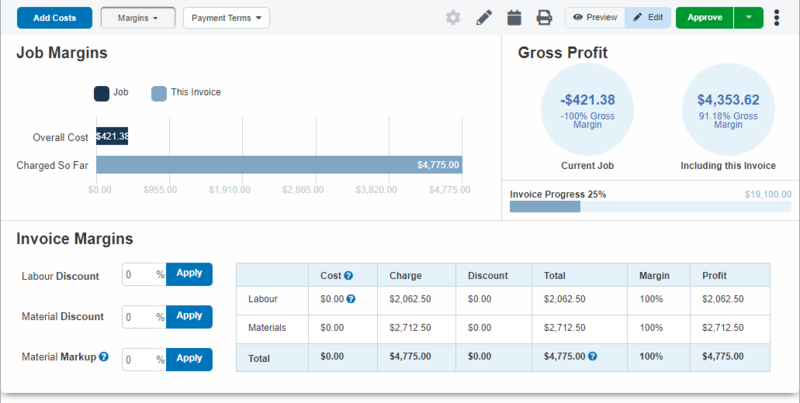 This will add a single combined line item to the invoice for the amount specified. Invoice the remainder of the quote if you've already sent out invoices and want to invoice out any outstanding costs. To invoice out the quote exactly like it was written, use the last option and tick Select All. Split into material and labour subsections: This will sort your line items into Labour and Material subsections under the site visit(s) being imported. Include outstanding credit line items: This lets you import credits from credit notes that haven't yet been reconciled to a credit to come. Only Import uninvoiced costs: Use this option if you've invoiced out the site visit previously but new line items have been added. This will tell Fergus to only import the line items that haven't been invoiced out yet. 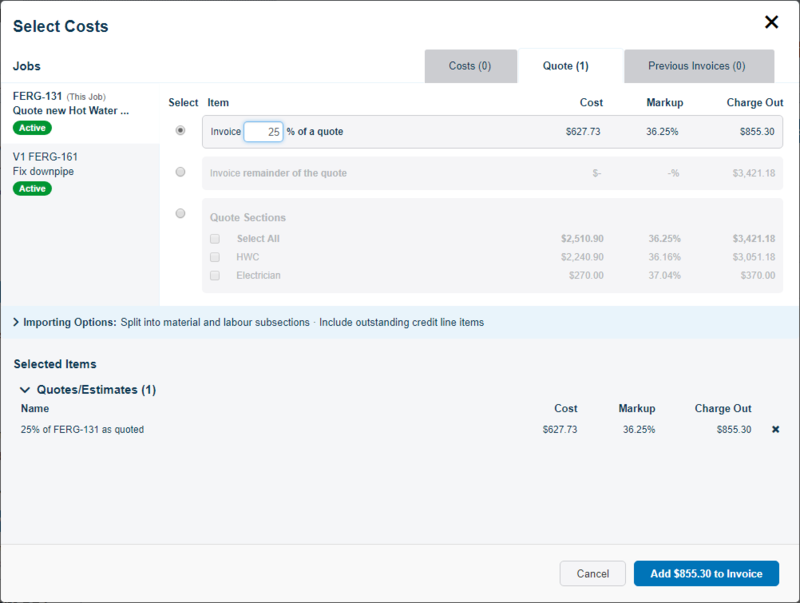 Now that your costs are on the invoice, you can adjust markups and apply discounts, and choose what is visible to the customer. You can easily see the progress of your invoice: charge-up jobs will show you the progress towards your customer's budget, and quote and estimate jobs will show you progress towards the total quoted amount. Default Formatting Options control what is visible on the final invoice to the customer. You can set a global setting here and override it in individual sections on the invoice. Display labour descriptions on labour line items shows the time entry description below the labour time and employee name line. If this is unticked, each time entry description is combined and displayed in the site visit section description. Put on hold to send the job to the Pending column of the status board if you're planning to come back to it later. Create new site visit if the job hasn't been fully complete just yet and you need to return. Mark as complete if you know the job is 100% finished and your customer is happy!